The WaterGuard Single T8 is a single fluorescent fixture ideal for aqueous environments, including the food industry and other industries. This weatherproof lighting fixture is available in four lengths, from twenty-four inches to sixty inches, and includes a Teflon® coated fluorescent lamp. All WaterGuard Single T8 weatherproof lighting fixtures feature electronic program start ballast with universal voltage (120-277 50/60Hz) and a factory pre-wired 8’ power cord with plug. A high efficiency reflector system increases foot candles directly under fixture, with T8 safety coated lamps included. (Other Kelvin temperature lamps available upon request.) Limited 1-year warranty. EncapSulite provides the longest lasting, best performing weatherproof lighting solutions on the market today. 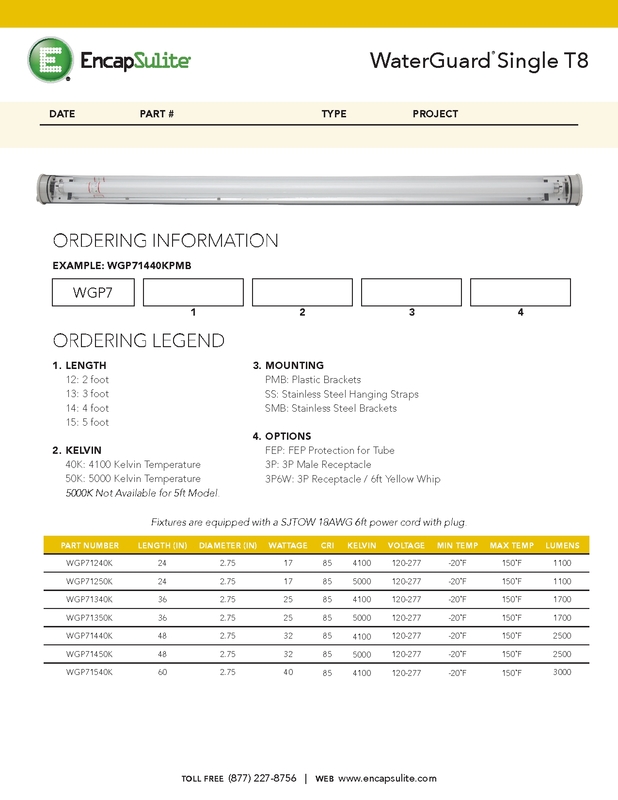 Request a quote on a WaterGuard T8 Single light fixture or contact us to learn more.